Each December, Mission Trails Regional Park (MTRP) celebrates Arbor Day to beautify the park, recognize the importance of trees in our environment, and create more shady areas for Mission Trails’ current and future visitors. The fall season provides the ideal planting conditions for young trees, and this year we will plant 10 coast live oaks at Mission Trails’ Kumeyaay Lake Campground (KLC). We will have an additional 10 trees at our nursery to be planted by MTRP staff as needed over the course of the year. Everyone is invited to the tree planting on Saturday, Dec. 1 at 9 a.m., meeting at the KLC Day Use Lot. The holes will be pre-dug; gloves and comfortable shoes are recommended and registration is not required. Whether or not you are able to come to the public planting on Dec. 1, you can support this effort by donating $100 to sponsor one of the 20 trees. Make a lasting impact on Mission Trails by sponsoring an oak tree to be enjoyed by park visitors for years to come. Many families have made a tradition of underwriting an Arbor Day tree in honor or in memory of a loved one. The recognition will be included in the MTRP Arbor Day Donor Book. To learn more about donating a tree to Mission Trails and/or participating in the annual Arbor Day event, please visit mtrp.org/arborday or contact the Mission Trails Regional Park Foundation at 619-668-3280. Arbor Day at Mission Trails is sponsored by City Councilmember Scott Sherman, the city of San Diego’s Parks and Recreation Department, and the Mission Trails Regional Park Foundation. 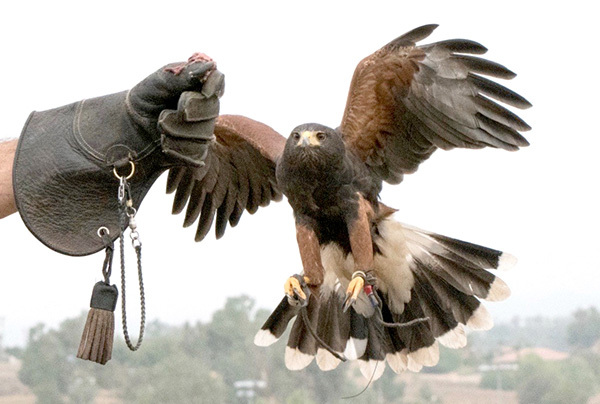 On Thursday, Nov. 29, Bob Gordon, M.D., will share his new, informative, and enjoyable talk, “Birds of Prey from All Angles,” at the Mission Trails Regional Park Visitor and Interpretive Center. Gordon, a retired physician, has published many scientific papers including “The Use of Canines in the Detection of Human Cancers.” In retirement, Bob’s interest in and involvement with raptors has grown, and includes assisting with raptor rehabilitation for Project Wildlife. Gordon regularly presents educational talks and demonstrations at Mission Trails, The Nat, and the San Diego Zoo. In the last five years, his experience as a licensed falconer has added a new dimension to his thinking about conservation and nature’s preservation. During his lecture, Gordon will consider birds both spatially and figuratively. New information will include the latest on bird evolution, classification, natural and human threats, as well as the practice of falconry. This program is geared for all nature lovers, even those who have little to no knowledge of raptors. Huxley, Gordon’s Harris’s Hawk and frequent companion, will be the moderator for the Q&A following the lecture. You can ask Huxley about his abatement experiences. Gordon and Huxley don’t require “even a Mc-mouse” as thanks for their presentation, but they encourage attendees to make a donation to the Mission Trails Regional Park Foundation to support its mission and help protect Mission Trails. Reservations are required. Learn more and register at mtrp.org/hawktalk. —Jennifer Morrissey is executive director of the Mission Trails Regional Park Foundation. Kids Nature Story & Craft with a Ranger: Every third Saturday, ages 5–7 start at 10 a.m.; ages 8–10 start at 11 a.m. – Meet at KLC Campground Kumeyaay Lake Picnic Structure, RSVP to 619-668-3279. *Partial listing of monthly events at Mission Trails Park. Please view our website for full calendar of free activities, programs, and updates at mtrp.org, or call 619-668-3281.